Lynn C. Harris has helped countless injury victims and their loved ones throughout the greater Salt Lake City and Provo area. Many times personal injury lawyers focus on car accidents, which can have a serious impact on a person's life and livelihood, but cyclists can also be severely injured while on the road, even when wearing a helmet. Scrapes, cuts, fractures, sprains, and breaks are all common following major bike accidents. What's more, after being knocked down off of a bike, the cyclist is prone and may be struck again by other drivers, which can lead to further injuries and even death. These five common causes of bike accidents should help you understand some of the dangers cyclists face and what you can do to protect yourself from injury or to prevent injuring people on bikes who share the road. While drivers are supposed to share the road with bicyclists, there are many times where reckless drivers do not take into account others nearby. Reckless drivers may cut-off bicyclists, refuse to give them space or the right of way, pinch them in while making turns, or may even antagonize and intimidate people on their bikes. In addition to recklessness, inattentiveness can lead to bike accidents. This could be anything from texting while driving to not checking rearview and side mirrors, or simply forgetting that there are others on the road besides people in cars and trucks. Biking during nighttime can be very dangerous if a cyclist isn't careful. 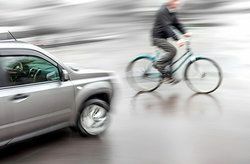 Drivers may have a hard time seeing a bicyclist and could accidentally run into them or cut them off at night when they otherwise would have given them the right of way during the day. When you are cycling at night, be sure to wear bright-colored clothing and/or reflective clothing. Reflective stickers are available to place on your helmet to help make you visible on the road. Be sure that you rear reflectors are in place as well, and that you ride in well-lit areas and remain extra-cautious when in traffic. Bicyclists have a duty to abide by traffic laws just as much as motorists. Given this, it should come as no surprise that biking recklessly or taking risks on a bike can contribute to an accident occurring. Bicyclists should do their best to ride with the flow of traffic and to remain outside of the blindspots of vehicles when on the road. Cyclists should also consider staying in bike lanes when possible and safe, though bike lanes can also pose a risk to cyclists since they can be struck by inattentive drivers in parked vehicles as they are opening their doors. Just like automobiles, bad weather and bad road conditions can lead to problems with traction and maneuverability. Rain, snow, sleet, and hail can make riding slippery, and debris on the road or tight turns can increase the chances of accidents occurring. Cyclists should use good judgment and caution when riding in poor weather. It's also advisable that cyclists scope out any road that they have to ride on just to make sure that it is safe for cycling. Some roads are simply dangerous for bicyclists and were designed with motor vehicles in mind rather than bike access. If you haven't been cycling long, you're bound to have some issues knowing how best to get around on a bike. That doesn't just mean directions. Riding a bike can be challenging when you're in traffic, and experienced cyclists know what to do and what not to do when they are around automobiles and on the road. When you're just starting out as a cyclist, be sure to know your limits and to ease into riding around traffic. As you become a better cyclist and more adept, your ability to ride and to avoid injury or harm will improve. If you would like more information about your legal rights following a serious bike accident, it's important that you contact a skilled personal injury lawyer today. By Speaking with Lynn C. Harris, you'll be able to get the legal representation that you need.